Burp! : Summertime Means Cheese Curds! Well, you must not be from Wisconsin, then. For those of us who live here in the cheese capital... dairy is an everyday treat. And cheese curds are the squeakiest of them all. That's why you've got to check out our article in the Summer issue of "Grate. Pair. Share." 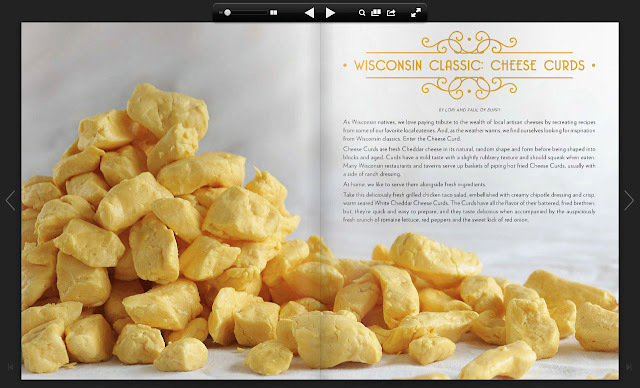 -- an online magazine showcasing the best of Wisconsin cheese. Aside from our article, which includes a recipe for a delicious grilled chicken taco salad with seared cheese curds (which are ALMOST as good as fried cheese curds), there are plenty of other great recipes. When I was living in San Francisco, I went to a local cheese shop & asked if they had curds The person working laughed and asked if I was from Minnesota or Wisconsin. I know what you mean, Kat. I've done the same thing. Always wondered why curds haven't caught on in other places... so squeaky and good! Mmmmm cheese curds are one f the things I miss about living in WI. So tasty!